WREN will always provide a strong voice for women and girls across South Carolina. We are committed to fostering an environment in which women are encouraged to lead and to advocate for policies that positively impact our lives and our children’s futures. WREN wants women to have the tools, facts, and skills to advocate. We encourage diverse, women leaders who can champion our concerns and speak out when our interests are being put aside or ignored by elected officials. WREN trains groups across the state on issues affecting women and girls, while also providing information on the legislative process and how to advocate and lead change in South Carolina. During legislative session, we also encourage advocates to meet us at the Statehouse to engage legislators directly in a supportive group setting. Starting in January 2019, please visit our event calendar to find these listed dates. If you have a group or organization that is interested in receiving an Advocacy 101 training, contact Megan Plassmeyer at MPlassmeyer@scwren.org, and for Meet Me at Statehouse, contact Damilola Ajisegiri at DAjisegiri@scwren.org. WREN’s Strategic Technical Advisory Group includes individuals who have special expertise that is relevant to WREN’s mission and to our educational, advocacy and political activities. These experts work in medicine, public health, law, economics, advocacy, and more. Advisors provide input and expertise to WREN staff and board members on an as-needed basis, and from time to time, the staff or board may engage advisers in projects or initiatives. If you believe you can help, please contact alidow@scwren.org. During the 122nd South Carolina General Assembly women held 23 out of the 124 seats (12 D, 11R) in the House and 4 out of the 46 seats (2 D, 2R) in the Senate. 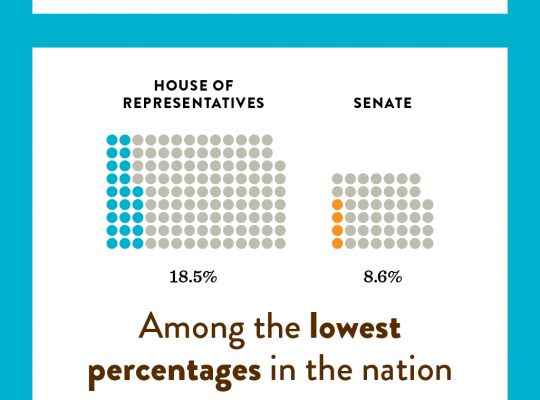 15.9% of the legislature is female. Women are dramatically outnumbered in senior leadership. Only about 1 in 5 C-suite leaders is a woman, and only 1 in 25 is a woman of color. Women are less likely to be hired into manager-level jobs, and they are far less likely to be promoted into them. For every one hundred men promoted to manager, seventy-nine women are. The disparity in the promotion rate to manager is even worse for women of color. Most notably, for every 100 men who are promoted to manager, just 60 Black women are promoted. Largely because of these gender gaps, men end up holding 62 percent of management positions, while women hold only 38 percent.